FILE - Republican presidential candidate Donald Trump gestures during a speech in Virginia Beach, Virginia, July 11, 2016. Alarm is being expressed following the 2016 Republican Party presidential nominee’s latest comments questioning the need to keep nearly 80,000 U.S. military personnel in Northeast Asia. 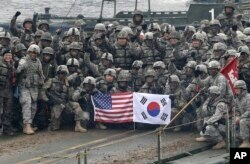 In an interview with The New York Times, Donald Trump said the presence of American troops in South Korea were “no guarantee we’ll have peace” on the Korean Peninsula, and he asked “what are we getting out of this?” by having troops, aircraft, ships and bases in Japan. The United States has long-standing alliances with Japan and South Korea to provide for their defense if they are attacked, and a key element of the Obama administration’s foreign policy has been a strategic “pivot” to Asia, which Trump apparently desires to reverse. Trump, in the Times interview, also said “maybe you would have had a unified Korea” if U.S. forces had withdrawn from the peninsula after the 1953 armistice that halted with a stalemate a bloody and devastating three-year war. “It’s foolhardy to have thought that we could have left there and the country would have unified itself. It would have unified itself by war, and it would have been another satellite of China,” said retired Army General John Wickham Jr., who commanded U.S. forces in Korea from 1979 to 1982. Trump’s comments on unification will, however, find a positive reception by most North Koreans and some hard-liner South Koreans who believe their country would never have split if the great powers had not intervened on the peninsula immediately after World War II, which removed the Japanese colonialists, said Balbina Hwang, a visiting professor at Georgetown University’s Center for Security Studies. Pyongyang may be expecting “short-term opportunities and benefits” from a Trump presidency, Hwang told VOA. But she cautioned that the North Korean government certainly “thinks he’s pretty nutty” and believes “they can manage whoever comes into office” at the White House. Statesmen, military commanders, high-level government officials and analysts with whom VOA spoke on Thursday all emphasized that America’s military presence overseas cannot be seen merely in stark, strategic terms. “Trump is trying to put a market price on incalculable benefits, which include boosting and supporting democracies and free-market capitalistic societies that directly contribute to America’s national economic wealth,” said Hwang, a former senior special adviser on Korean affairs at the State Department. If American forces are removed from Northeast Asia, “we would destroy our economy” from a loss of free markets in the region that would come under the control of China and Russia, said Hwang. The Pentagon recently announced it was enhancing missile defense in South Korea and will deploy two THAAD batteries to the country, a move White House spokesman Josh Earnest said Thursday is “meant to protect our allies from a North Korean missile threat.” Each unit is estimated to cost about $1.6 billion, according to defense analysts. “The very real security challenges and, frankly, economic opportunities that are resident in that part of the world require a strong, robust U.S. presence,” said State Department spokesman John Kirby, emphasizing the Pacific pivot policy of the Obama administration. “It’s clear that Trump has not studied and is thus ignorant about American interests, American policies and the history of the American presence in that part of the world, particularly in Japan and Korea,” Mondale said. Trump also questioned whether the United States would automatically defend other NATO allies, the foundation of America’s alliance with Europe since the end of World War II.